Home » Learning English can make you fly. Yes, literally. Learning English can make you fly. Yes, literally. Learning English is not only about knowing how to communicate with other English speakers but also achieving your goals and dreams. If your dream is to fly – literally – and become an Aviation Pilot or ATCO (Air Traffic Control Officer), you must learn English. It’s not optional! In 2008, The International Civil Aviation Organization (ICAO) set English Language Proficiency requirements, applicable to both native English speakers and English as a second or foreign language speakers, to ensure that pilots and air traffic controllers are able to understand each other all around the world, for accidents prevention and safety. ICAO’s proficiency levels (1-Pre-elementary to 6-Expert) define the guidelines for Pronunciation, Fluency, Structure, Vocabulary, Comprehension and Interaction. Level 4 – Operational is the minimum level you must attain and assures that the candidate’s pronunciation is understandable, as minor grammar errors rarely interfere with meaning while vocabulary is accurate enough for work related topics. Pilots and ATCOs qualified at Level 4 are reassessed every three years and Level 5 every six years, while at Level 6 no further assessment is required. In addition to the ICAO’s requirements, many airlines demand some English proficiency level from their flight specialists including a passing score on language tests such as the International English Language Testing System (IELTS™), the Test of English for International Communication (TOEIC®) or the Test of English as a Foreign Language (TOEFL®). Wayman Aviation Academy in Miami requires ICAO Level-4 for its Flight Training Programs, which includes Professional, Private and Commercial Pilot Training, Instrument Rating, Multi-Engine, and Foreign License validation to acquire an American FAA Certification based on the student’s foreign certification. Wayman has been training professional pilots in the USA for 30 years. We can help your aviation career take off. 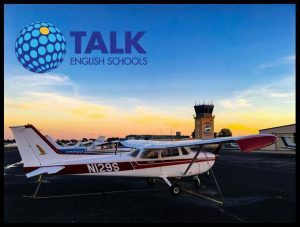 TALK English Schools with over 20 years’ experience helping students master English is now committing itself to the English proficiency training of pilots and ATCOs. Our schools in Aventura, Miami, Fort Lauderdale and Miami Beach offer an Intensive English course and TOEFL® iBT Exam Preparation. Plus: you can study with your F-1 student visa. You will develop the required English skills to take over the skies while enjoying a rich learning environment and meeting people from all over the world. “It requires a huge dedication to learn to fly an airplane”, says Fabiano Guerra, TALK Miami Beach former student, from Brazil. “And, of course, the proficiency in English matters. It’s the universal language for aviation”. 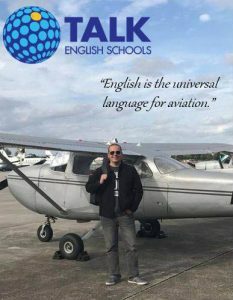 Fabiano studied General English advanced level and Business English at TALK, and now he has his Private Pilot license. His next step is to receive his instrument rating. Contact us now and learn how TALK English Schools can be your pathway to the sky!